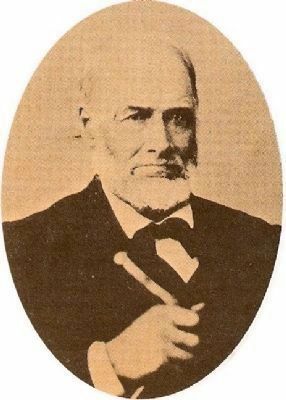 James Marshall arrived in the “Collumah”, valley home of the Nisenan, on May 8, 1847 to map the site for a sawmill he was to build in partnership with John Sutter. On August 18, Marshall returned with a crew, mostly Mormons, to build the mill. On Monday morning, January 24, 1848, while inspecting the tailrace downstream of the partially completed mill, Marshall picked up a flake of pure gold. The valley, the lives of Marshall and the Nisenan, and the land called California were forever changed. Erected 1998 by California Gold Discovery Sesquicentennial, Grand Parlor, Native Sons of the Golden West, California State Parks, January 24, 1998. Marker series. This marker is included in the Native Sons/Daughters of the Golden West marker series. Mill and Gold Discovery Site. Marker is in this post office area: Coloma CA 95613, United States of America. Touch for directions. Other nearby markers. At least 8 other markers are within walking distance of this marker. 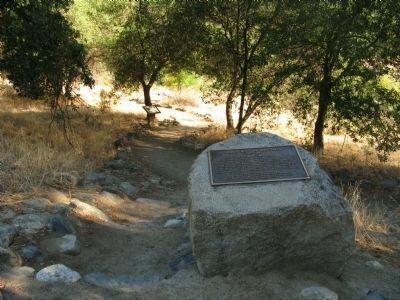 Partners In History (a few steps from this marker); The Coloma Road (a few steps from this marker); Mormon Cabin (about 300 feet away, measured in a direct line); Sutter Mill Replica (about 300 feet away); James W. Marshall (about 400 feet away); Chinese Miners of the Mother Lode (about 400 feet away); Chinese Stores (about 400 feet away); Sutter’s Mill Site (about 400 feet away). Touch for a list and map of all markers in Coloma. Regarding James Wilson Marshall. 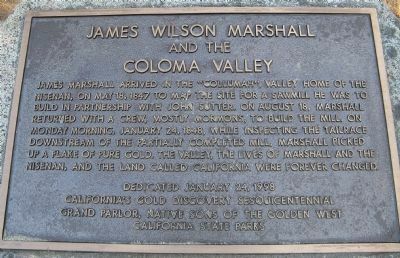 Also see: All James W. Marshall, Sutter’s Mill and nearby Coloma markers for additional information. 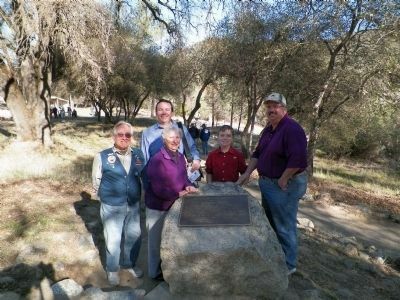 Native Sons of the Golden West Members pose by the monument. The location of the new replica sawmill is visible in front of the tent in the left background. James Wilson Marshall, born in New Jersey in 1810, was a quiet and moody man, a carpenter and wheelwright by trade. 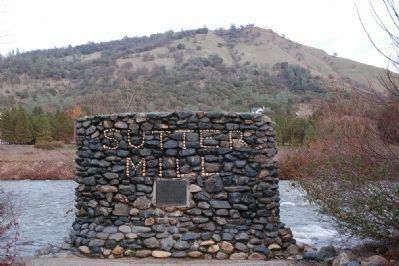 In 1847, he entered into a contract with "Captain" John Sutter to build a saw mill in Coloma, where he discovered gold in the mill's tailrace on January 24, 1848. When the news leaked out (almost immediately), miners flocked in. 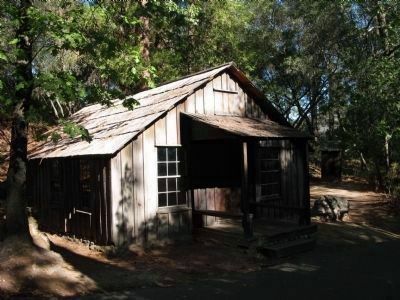 Efforts by Marshall and Sutter to claim ownership of the Coloma area failed, as did Marshall's efforts to charge a commission for the gold mined there. He was run off the land when he persisted. He began making claims that he had special powers to locate gold, so he was often followed and sometimes threatened. He ended up living in Kelsey, just a few miles from Coloma, where he operated a blacksmith shop and sold his autograph on bits of paper to supplement his income. He died lonely and bitter in 1885 at age 74, never having enjoyed the wealth he helped others to find. He is buried under his statue in the State Historic Park that bears his name. 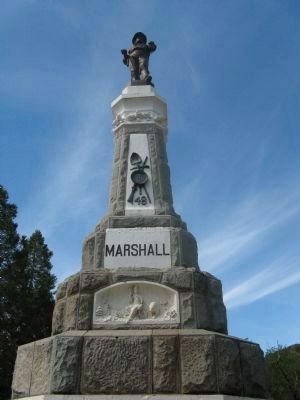 The monument was built in 1890, not far from Marshall's cabin. of El Dorado Hills, California. More. Search the internet for James Wilson Marshall. Credits. This page was last revised on June 16, 2016. This page originally submitted on October 10, 2008, by Syd Whittle of El Dorado Hills, California. This page has been viewed 4,038 times since then and 12 times this year. Last updated on December 15, 2010, by Ken Horn of Springfield, Missouri. Photos: 1, 2. submitted on October 10, 2008, by Syd Whittle of El Dorado Hills, California. 3. submitted on February 3, 2014, by James King of San Miguel, California. 4. submitted on October 10, 2008, by Syd Whittle of El Dorado Hills, California. 5. submitted on March 8, 2006, by Karen Key of Sacramento, California. 6. submitted on August 19, 2008, by Syd Whittle of El Dorado Hills, California. 7. submitted on October 10, 2008, by Syd Whittle of El Dorado Hills, California.